Expanded closets help to hide small appliances, utensils, and other cooking supplies. Convenience and functionality are behind a new idea in kitchen design that is growing in popularity with many different types of home buyers. Much like the trend of larger showers a decade ago, I see the footprint of the pantry space growing in upcoming years. New homeowners are gravitating to upgrading this space to hide everyday messes in order to keep a clean, welcoming look in the kitchen. 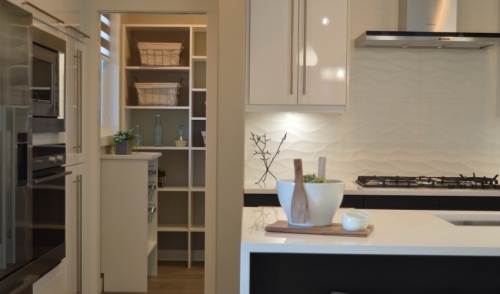 This trend is also popular because it allows home builders to showcase additional cabinet or shelving options to offer a vary of choices to their buyers. These spaces have the ability to be designed as custom or basic as needed to fit buyers' budgets and lifestyle. With the growing trend of simplistic white kitchens, these "super pantries" allow everything from the Gen X family to store extra snacks and a beverage fridge to the empty nester who needs room for the Kitchen Aid mixer, coffee maker, and additional pull out storage. As the kitchen continues to be the entertainment hub of the home, this customizable space is a trend that will only grow in the years to come. Click on the slide show at left to see some of the recent super pantries we have created.